Delicious Scraps: New CU Layered "Starry Overlays" in the Shop, LO by Beverly and a Free Paper Pack! New CU Layered "Starry Overlays" in the Shop, LO by Beverly and a Free Paper Pack! Here is a brand new set of CU Starry Overlays - includes psd and png files for better compatibility. Click on the preview to grab them at my shop on sale for 99 cents! Don't forget to grab the latest addition to the "Spring Mini"
Thank you so much, Ilove it. Thank so much. I love this mini-kit...these colors are so fabulous, thanks again. Merci beaucoup, il est trop cute ce kit. Bye..bye...and happy week-end. Thank you so much for this post. 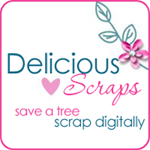 I want to let you know that I posted a link to your blog in CBH Digital Scrapbooking Freebies, under the Page 2 post on Jun. 23, 2011. Thanks again. super cute mini, love the paper! Love the spring mini kits! Awesome! Thank you so much for sharing!